1st pressing of 1000 copies with green labels, 100 copies with "Skate Park" sleeve. 2nd pressing of 1000 copies with tan labels. 3rd pressing of 1000 copies with white labels. All Pressings issued with different lyric sheets. Does anybody else have a copy of this 7" where the addresses on the insert are blacked out with sharpie?
" 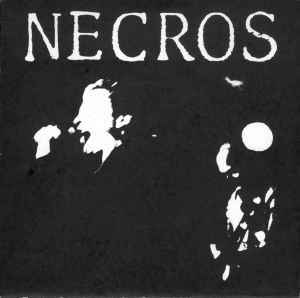 This isn't very original, it's very D.C. influenced but the Necros really are a great band. They have a lot of energy and have progressed a great deal since the last single. "Race Riot" is one of the best songs of the year by far. " review from DECLINE OF ART #2, New York 1981.